I’ve never cooked duck before, and I’ve only eaten it on rare occasions, and usually it was cooked by my dad in the slow cooker. He stopped by this Sunday to bring me some more tomatoes, fire wood, and some duck breasts. Fresh duck breasts, if you know what I’m saying. These aren’t the giant plump breasts that you can find at the store with a good amount of fat on them. These are small, fit in the plam of your hand, completely trimmed breasts. You can certainly use store bought duck, just know that they are quite a bit bigger and usually have a good amount of fat on them. This put a wrench in my somewhat planned menu for the week because I really didn’t want to freeze it, as I knew it’d probably get lost in there. We’re heading up to the great city of Duluth this weekend to see one of my bestest childhood friends. Oh, and Jerry Seinfeld. Wahoo! Anyway, because we’ll be out-of-town for the weekend, we have a limited number of meals, and with almost every meal comes leftovers. I decided to throw the beef roast I had in the fridge in the freezer and make it another time. Back to the duck. I needed to find something to do with it other than the slow cooker, and I turned to my number one source for wonderfully delicious recipes, Food and Wine. I came across a recipe from Andrew Zimmern, a Minnesota resident, that sounded interesting. 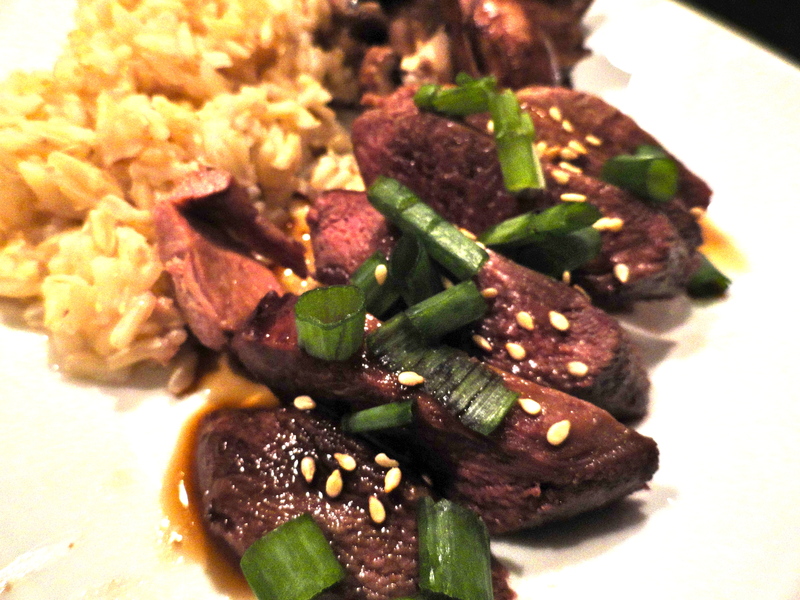 I truly adapted this recipe to my own, as I didn’t have dashi powder or mirin. A quick stop at my Asian market and I’m sure I could have found them, but I wasn’t sure how much more I’d use them, so decided to use some substitutions. From my vague understanding of dashi is that it is a cooking stock. There is ultimately no substitute, but to come somewhat close, I used chicken broth with a dash of fish sauce. Who knows how close this comes to dashi, but at least it’s creative! Mirin is a little easier to substitute. It’s a very sweet Japanese rice wine. I used sherry instead. 1. In a large sauce pan, combine chicken broth, sake, soy sauce, sherry or mirin, sugar and fish sauce. Bring to a boil, then reduce heat. Simmer for 45-60 minutes, until glaze is syrupy and reduced to about 1/2 cup. 2. Heat oils in a large skillet over high heat. 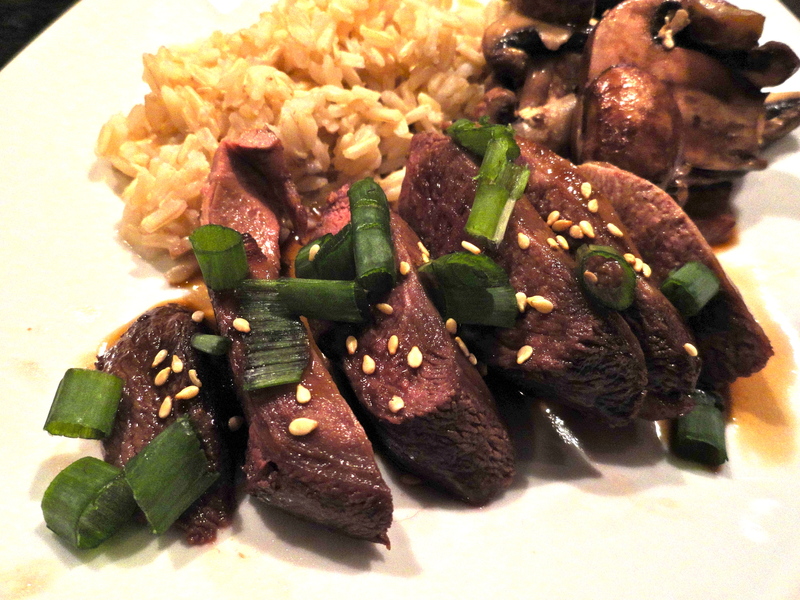 When oil is shimmering, reduce to medium-high, and add duck breasts. Cook for 4-5 minutes. Flip breasts and add glaze to pan. Cook for another 5-7 minutes, to desired doneness. Remove duck from pan and rest for 5 minutes. 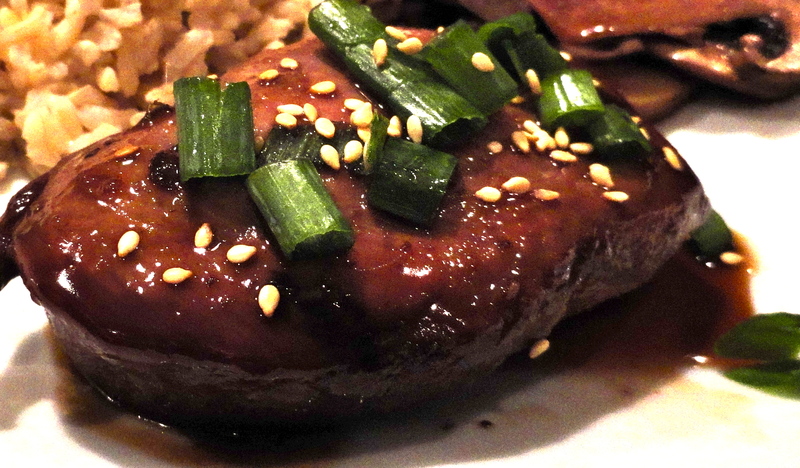 Serve with additional glaze, green onions and sesame seeds for garnish.